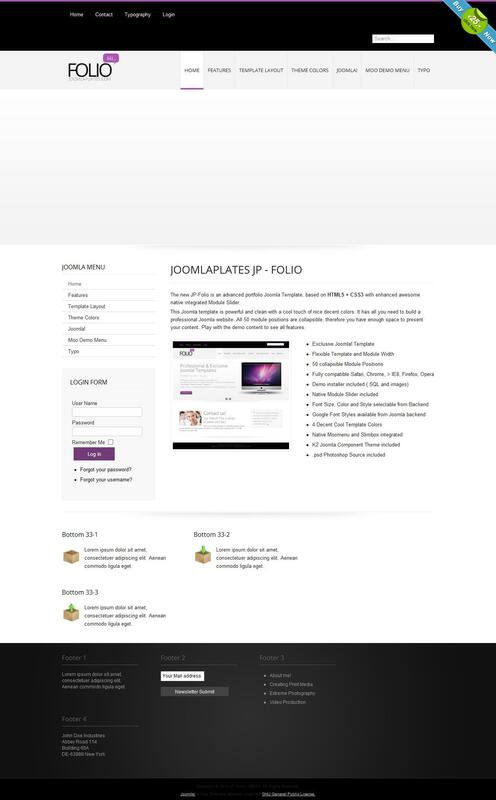 JP Folio - business template created in bright colors under Joomla 2.5. He developed a team of professionals from designers Joomlaplates. Template designed based on new technologies HTML5, CSS3. Allows you to create professional websites with high quality. Its design is done in bright colors. There is always the possibility for choosing color schemes, it consists of four preset styles. As part of the modular design layout contains nearly 50 items. They can provide high-quality mapping is all the elements. Made it on the resource. In the assembly was listed company called rotator Module Slider. It is fully integrated within a known component K2. It can enhance the site. Among its advantages should be noted considerable speed loading, cross-browser support and all sorts of mobile devices.